J.P. Crawford was ranked the third best prospect in all of baseball by Baseball America last July. A year later, their harsh criticism has helped fuel him to a monster second half that has him on the big league radar. ALLENTOWN – Had it been a month or so earlier, J.P. Crawford probably would have grounded out weakly back to the pitcher or hit a foul ball straight up the third base line for the third out of the inning, squashing a rally. But five weeks ago at Coca-Cola Park, everything was already going his way after a brutal first calendar year in Triple-A. And so instead of a harmless third out, Crawford teed up a pitch from Gwinnett right-hander Kris Medlen and hit it about 400 feet, off the wall in center. Andrew Pullin scored. Mark Leiter scored. Scott Kingery scored. And then Crawford attempted to score, too, but look like a dead duck between third base and home. Until he pulled the slickest of slick moves, slowing up at home plate to pretend like he was giving up to be tagged out, only to quickly drop into a slide and through the legs of catcher David Freitas to put the perfect bow on an improbable inside-the-park grand slam. “I’m still tired from that run,” Crawford joked at his locker stall five weeks later, prior to Tuesday’s game against Syracuse. Crawford has been doing a lot of things lately. His turnaround in the last 2 1/2 months, following a dreadful first two months of the 2017 season, is as unpredictable and remarkable as his nifty slide on last month’s slam. And it’s led him to follow Rhys Hoskins’ path of learning a new position in the last full month of the minor league season (for Crawford, third base) in order to increase his versatility in the event of the big league call-up next month. It’s no secret that Maikel Franco has struggled as the Phillies regular third baseman this season (his .664 OPS and -1.2 WAR both ranked 21st out of 21 qualifying big league third baseman entering Tuesday night) and the Phillies are in no hurry to move Freddy Galvis from shortstop, where he will likely be a Gold Glove finalist for a second straight season and entered the 2017 season with the goal of starting all 162 games, something Pete Mackanin is trying to help him achieve. Phillies general manager Matt Klentak told reporters Tuesday the Crawford move is a temporary one (again, not unlike Hoskins) and that it was not a message to Franco. Since Galvis is a free agent after 2018, there is still a long-term vacancy for Crawford to fill at shortstop. I mean, [a guy] from Baseball America thinks they know what they’re talking about – I just have to go prove them wrong. I mean, I’ll let my play do the [talking] and go from there. But entering this summer, some began to question if Crawford would ever become that guy and live up to the hype he quickly achieved as a fast-risking former first-round pick. Some wondered a little too loudly for Crawford’s taste, even. Some background: Crawford was ranked as the 6th best prospect in all of baseball according to Baseball America entering the 2016 season. He had been considered the top prospect in the Phillies system since Franco graduated to the big leagues (read: a long time ago). But then in early July of this year, when Baseball America’s 2017 midseason Top 100 rankings came out, Crawford dropped nearly 80 spots, to 92nd, and the publication’s editor, John Manuel, told CSNPhilly.com's Jim Salisbury they considered omitting him altogether. Given what Crawford had done in his first calendar year in Triple-A, it may have been somewhat harsh criticism but it wasn’t outlandish given the numbers. From May 20, 2016 to May 19, 2017, Crawford slashed .228/.291/.296 with 20 extra-base hits in 407 at-bats. Since May 19 this year? Crawford is slashing .270/.369/.481 (entering play Tuesday). Since those humbling Baseball America rankings were published last month and their editor’s assessment of Crawford ran on July 12? Crawford has slashed .306/.390/.549 with seven home runs, eight doubles, and three triples in 144 at-bats over his last 37 games. All it is is motivation.. When asked if something “fired him up” recently – Crawford sent that not-so-cryptic tweet the day Baseball America's criticism ran on CSNPhilly.com – the IronPigs shortstop/third baseman was honest. Its seems to be working, J.P.
Was it particularly unflattering that all of the prospect love came crashing down so quickly from the people that were doling out the love? Crawford was ranked the third best prospect in baseball by Baseball America in their 2016 midseason rankings. And so now Crawford is making an impact, almost nightly. On Tuesday, he followed up Scott Kingery’s leadoff double in the first inning with a run-scoring hit to give the IronPigs a 1-0 lead. 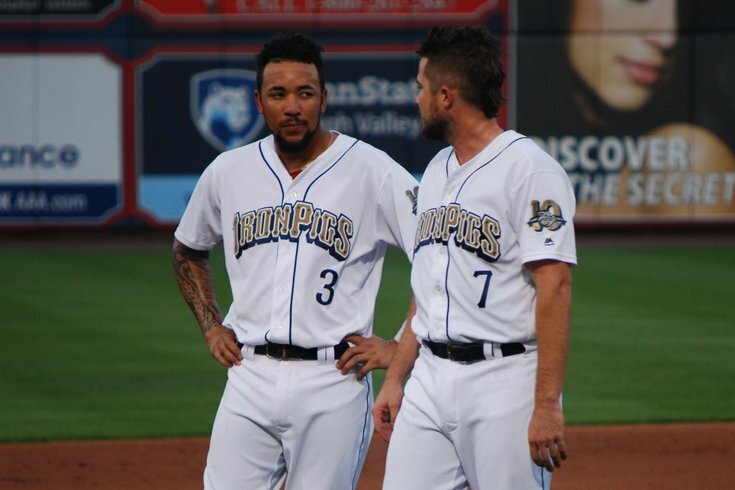 “Everyone has a way to get motivated, and if that was it, then I’d like to thank you guys,” IronPigs manager Dusty Wathan joked with reporters Tuesday afternoon. But back to the sheer madness of Crawford’s 2017 season. He slashed .189/.311/.249 with seven extra-base hits in the season’s first two months (from April 7 to June 9) over 55 games/239 plate appearances. In the last 2 1/2 months, since June 10: .293/.384/.545 with 11 home runs, 13 doubles, and five triples in 58 games/255 plate appearances. Crawford has more extra-base hits in three weeks this month (eight, including three home runs) than he had in season’s first 10 1/2 weeks (seven). Crawford sat out nine straight games from June 11-19 with a groin injury but admitted it was just as much of a mental reset. And now Crawford is relaxed. And confident. And trying to ignore any lingering critics as he tries his hand at a new position in hopes of making his major league debut next month. Crawford handled his first couple of chances at third base without issue on Tuesday night.